In my writings, I’ve used the word “cryptocurrencies” and “tokens” as synonyms, but that’s not quite right. A cryptocurrency is something that runs on its own blockchain (or DAG, in the case of RaiBlocks and IOTA) and is usually intended to work as money — examples of this are Bitcoin, Bitcoin Cash, ARK, etc. A token is more like a second-layer “utility” that lives on an existing blockchain. The most commonly known type of token is the ERC-20 standard token which is facilitated by the Ethereum blockchain. Sometimes coins will start out as ERC-20 tokens with the intent of later hosting a sort of “trade-in” event for coins on its own blockchain. EOS, for example, is planning on doing something like this in June 2018 — and QTUM already migrated to its own blockchain. ERC-20 tokens are essentially held in Ethereum wallets, with a slightly modified process. This means that something like a Ledger or a Trezor can be used to store them. However, not everyone can afford the deluxe security a hardware wallet provides, so this guide does not go in that direction. 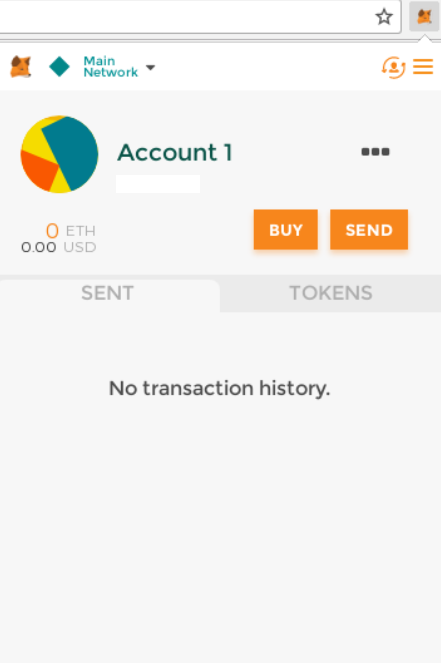 It is also possible to add non-natively-supported ERC-20 tokens onto Coinomi (my preferred wallet) via a fairly straightforward process — this is certainly a less expensive option than a hardware wallet, since all you need is a relatively low-cost Android phone to make it happen. This still requires buying something, even if you already have an Android phone, since it’s not recommended for you to use your daily-use phone for storing cryptocurrencies. I’ve thus decided to focus this guide on MyEtherWallet, which you can use from the convenience of your computer. Some consider this to be a little more complicated than the usual process of downloading and using a cryptocurrency-specific wallet, but it’s really not that bad — especially when you have me to show you how! Quick warning: like anything else this stuff is only as secure as the device you’re using. If you go through this process on a computer that you use for everyday browsing, and that computer is infected with malware, you might be setting yourself up for a very bad time. Because of this, I don’t recommend doing this on anything other than a standalone crypto-only-computer (or at least a virtual machine) if you have any significant amount of funds. Is he supposed to look sort of like Star Fox? Now that you’ve done this preliminary step, it’s time to set up MyEtherWallet and connect it up to your MetaMask extension. First, you’ll be prompted to enter a password. Make this another strong password — and not the same one you used for MetaMask. Download the Keystore JSON file when it prompts you — this is a backup encrypted by the password you chose. You’ll be prompted with the private key. This is the most sensitive piece of information throughout this whole process — by itself it grants full access to everything in your wallet. There’s a convenient “print wallet” button here, but for increased security I suggest you instead write this down on a piece of paper, apply waterproof laminate, and store it somewhere safe. This is admittedly a bit tedious given how long the key is, but it’s worth the extra effort. 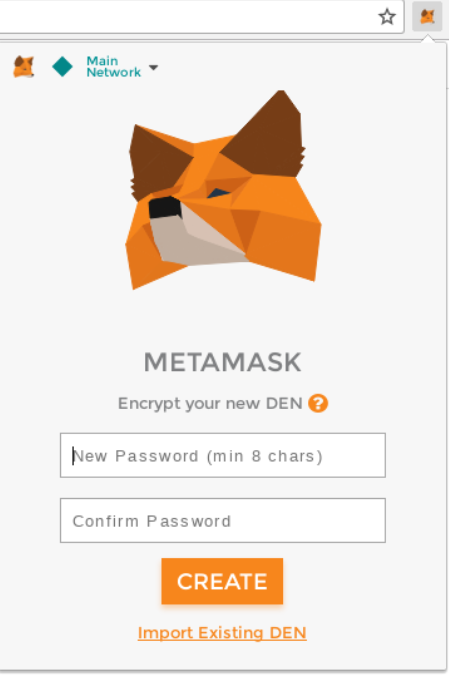 You’ll then be asked, “How would you like to access your wallet?” Click MetaMask, then click the blue “Connect to MetaMask” button on the right. Now you’re ready to send some ERC-20 tokens into your MyEtherWallet. See that address below “Your Address”? You can use this to receive any ERC-20 token. This is a multi-wallet like Coinomi, so you store any number of different supported tokens here. For example, if I wanted to withdraw my FUN tokens from an exchange like Binance, I’d simply direct it towards the address in the “Your Address” field in MyEtherWallet. Scroll down until you see the ticker you’re looking for, such as FUN for FunFair. You could also use ctrl+f to search for “FUN” (or whatever token you want). If it’s not present, just click “Add Custom Token” instead; however, I have not yet needed to do this — almost every reasonably known token of merit is listed here. Once you click the “Click to Load” text, you’ll see how many tokens are available. Getting your tokens out of MyEtherWallet is very simple. 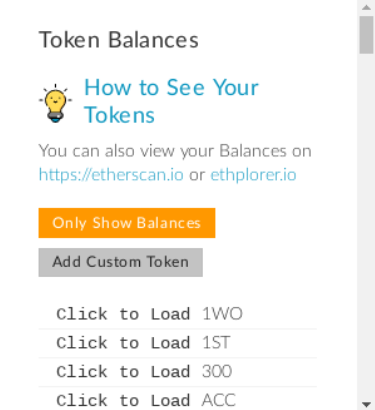 Click “Send Ether & Tokens” at the top of the MyEtherWallet page. Just like that, you will have sent tokens from MEW! There are a few more things you should know for security purposes. When using the MyEtherWallet site, do not rely on a search engine to get you there. Actually, it is even possible to run MyEtherWallet totally offline, and you should do this if you are interested in increased security. They provide a useful guide for offline setup here. Finally, any time you’d like to access your MEW in the future, just use the “Connect to MetaMask” button again. If feasible, store your coins offline in a wallet for security purposes. Use an inexpensive Android phone with the Coinomi wallet app, or go ultra secure with a hardware wallet like the Ledger or a Trezor. If you’re looking for a lengthier guide to purchasing altcoins (including ERC-20 tokens) from start to finish, just take a look at my page — I’ve written a lot about this!